I can’t believe that it’s already April. Last year for the first 100 days of the year my mom and I did burppies every day. It was a great challenge, one I decided not to repeat. I decided to take on a different challenge this year. Go to the gym every day for at least the first 100 days. Well, I made it through the first 103 days of the year without missing, and technically I’ve gone 104 days in a row as I went to the gym on New Years Eve. Going to the gym came easy, its what happened when I wasn’t at the gym that has been a different type of challenge. The first 30 days flew by. Other than making it to the gym on January first, when I felt too tired to do anything, it wasn’t difficult to make it to the gym every. Even though I thought making it a week straight would be the real challenge, as 6 days in a row was my previous top, but I set my mind to it and January turned into February. But as you may have read, my year came crashing to a halt on day 45. If you do the math. you’ll know this was Valentine’s Day, the day my Pathfinder died. But this didn’t stop me from going to the gym. Still in shock from the accident, I made my way to the gym late on the night of the 14th. Two days later, when I was preparing my house for my birthday party, I nearly ran out of time to go to the gym, but while the pork was marinading and the rice was cooking, I dashed off to the gym and did a quick 100 sit ups (my goal was to go to the gym every day, not have an extreme workout every day, and every little bit counts). After those hiccups, it didn’t seem like anything could stop me. Well, not a huge blizzard that canceled worship at The Neighborhood Church on March 3rd, day number 62 of the year. Then the gym closed. But did that stop me? No, I didn’t let 24 hour fitness’s decision to remodel their Kipling location hinder my workouts. From the 8th of March to the 13th I drove to the other 24’s in my area. I thought about taking that time off, but since I’d made it when my car was wrecked and when I had hardly any time, I couldn’t let the inconvenience of having to drive 15 minutes stop me. Heck when I lived in Guatemala I used to walk 45 minutes to get to the gym. I guess that’s how I managed to make it all the way to 100 days in a row without missing a workout. On the way to 100 Days I bought a car to replace my wrecked Pathfinder. My car insurance really helped me recover from that wreck. And then just as I passed 100 straight days at the gym, on day 101, my new car died on me. It’s not fixable either. That Thursday night, frustrated about my car problems, I found myself at the gym. I didn’t want to be anywhere else. Well, maybe in Guatemala where I didn’t need a car. 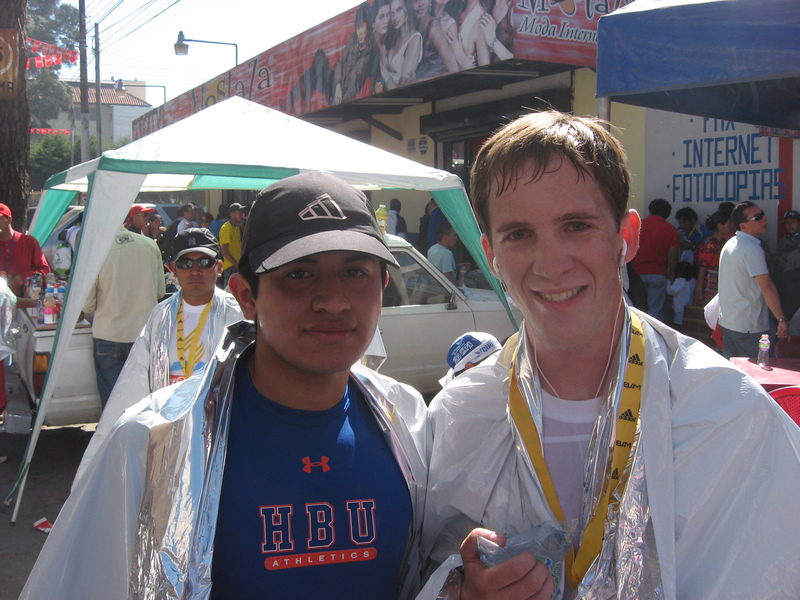 But I couldn’t go to the gym everyday there, as my gym in Xela was always closed on Saturdays. But something I could do in Guatemala, and I’ve continued to do every day here in Colorado is read my Bible and trust in God. This is something I’ve tried to do every day for the last 8 years. And that part of my day, the time in prayer and the Bible, is what really helped me make it through the first 101 days of the year. Spending time with God every day made going to the gym easy. If my eyes are focused on him, my true prize, running, biking, and lifting will come easy. The hard part is trusting God when everything seems out of control. Like when my car died. But here is what I read out of the Jesus Calling that night after going to the gym to burn off my frustration over the loss of another car, “This is the day that I have made. Rejoice and be glad in it. Begin the day with open hands of faith, ready to receive all that I am pouring into this brief portion of your life. Be careful not to complain about anything, even the weather (or cars in my circumstance), since I am the Author of your circumstances. The best way to handle unwanted situations is to thank Me for them. This act of faith frees you from resentment and frees Me to work My ways into the situation, so that good emerges from it. Going to the gym helps me feel good. I like how I feel right now after setting aside time to be active each day, but spending time with God, reading his word, and praying to him, gives me true hope for a future filled with Joy, because he is in control. He will redeem this day and he just might do it while I’m at the gym. I am so glad that God will guide our way. It’s so comforting. Next Next post: Start of Summer!